So SO many apologies are owed to my long time committed readers of this blog. We were all sad to see it go after having many happy holiday around New Zealand and enjoyed the wonderful convenience of travelling in a bus / campervan. However – we were still travelling, but in another direction. We moved to a lifestyle block. We are the very proud owners of a tiny two bedroom cottage on an acre and a bit of prime NZ land. Slowly but surely, aided by funds from the sale of the Blog Bus, we are doing up our do-er upper with the addition of some KiwiAnnison favourites: a huge veggie garden, a tractor shed (full of tractors! ), a paddock for the miniature horse, a field full of Christmas trees and chooks… etc…. 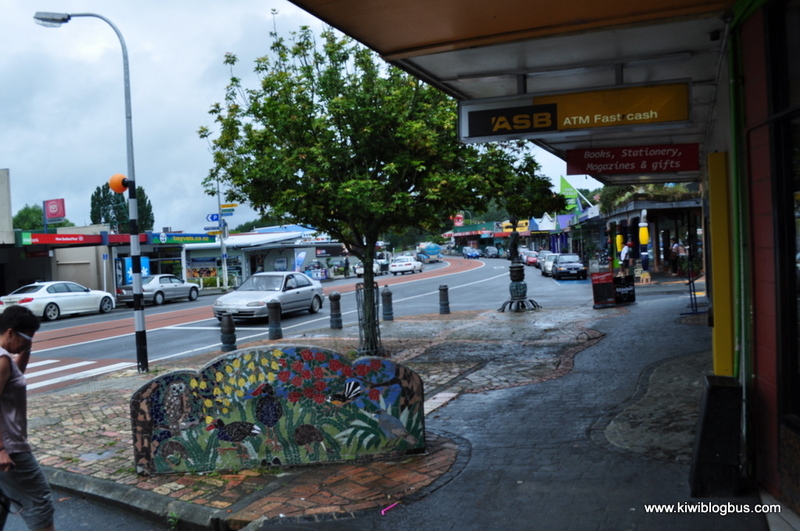 And for Kiwi Blog Bus fans – I may still dip in here and write up a few travel stories from the good old bus days, or just general NZ travel tales I think you may just be interested in. I won’t finish with a goodbye as hopefully this is the recommencement of something that lots of you will stick by my side on. Since we came to live in New Zealand, and probably even before, I heard so much about the Bay of Islands that it obviously had to go onto our Must-See list (and my personal bucket list). 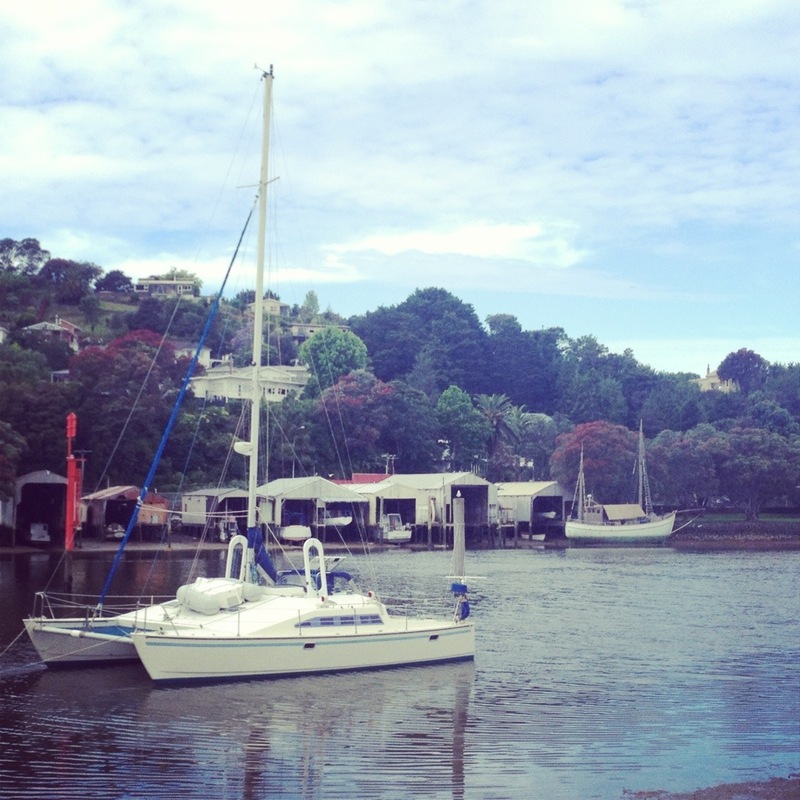 So on our first trip ever up to Northland and the Far North (is that the opposite of the Deep South?!) 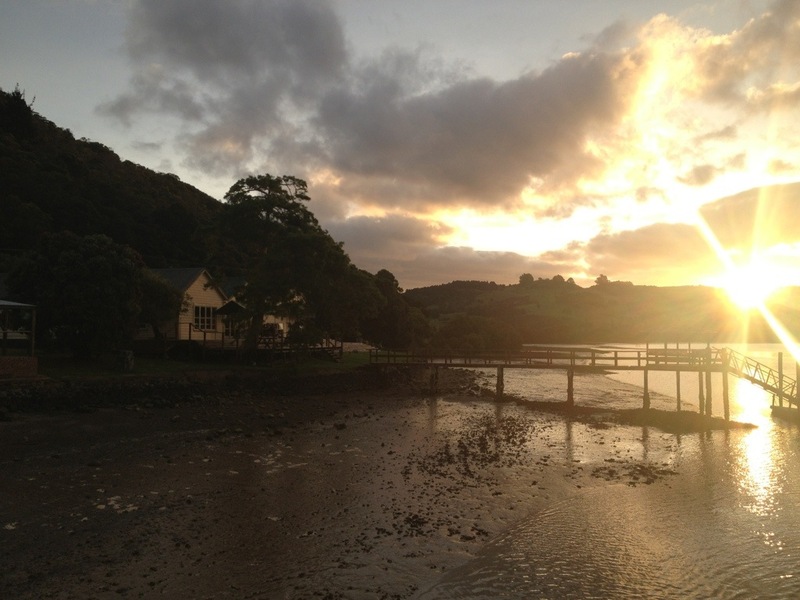 I was eagerly anticipating our arrival in the Bay of Islands. On our approach to the Bay of Islands I noted that we were to drive near Kawakawa. As this was the infamous home of the Hundertwasser Toilets, I duly prodded the driver and requested (for his benefit of course) that we take a driving break in the locality of this tourist attraction. 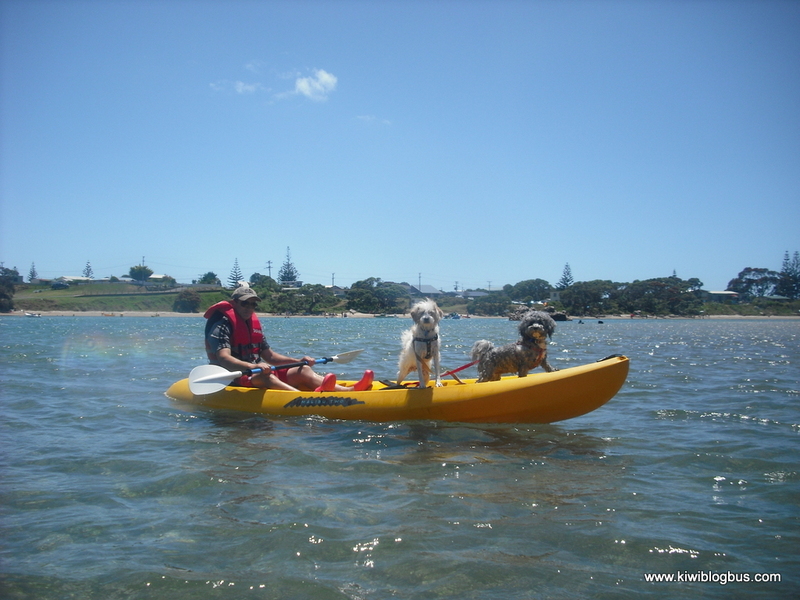 Strictly speaking I cannot say three men in a boat – to be accurate it would have to be three humans in a kayak. Or perhaps, at times, one human and two dogs – but you get the idea. Our summer trip was underway. 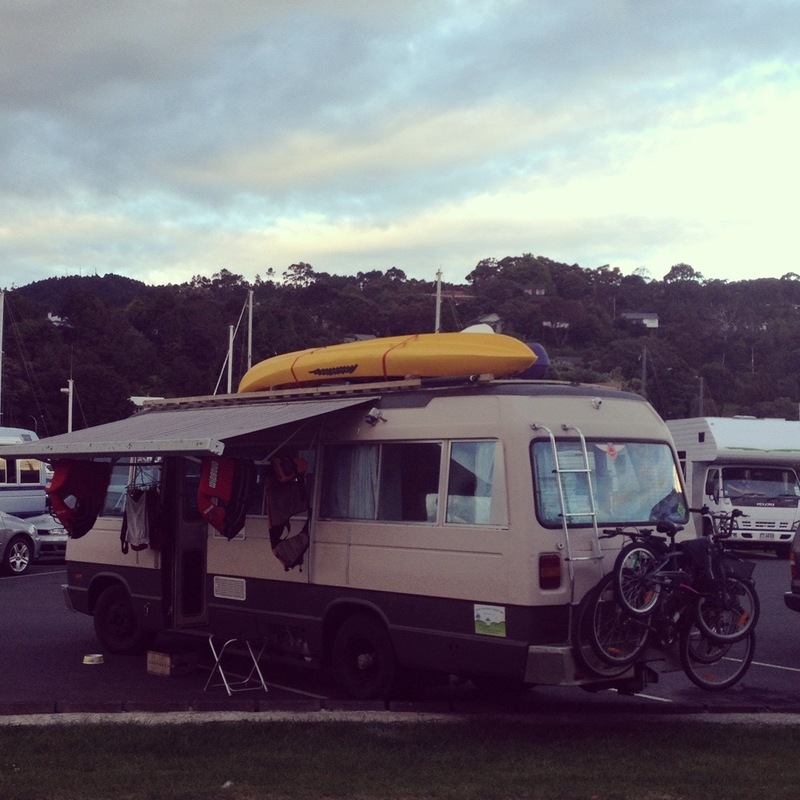 We had packed up the Kiwi Blog Bus with leftover Christmas goodies and collected our Trade Me buy en route (a double kayak – that’s actually a 2 person plus room for a little one). Just sharing my view from bed this morning…..
I’ve been out of phone signal lately ( yesterday we went up Cape Reinga at the Northern point of NZ) so I’ll have to do full blog posts when I get home. 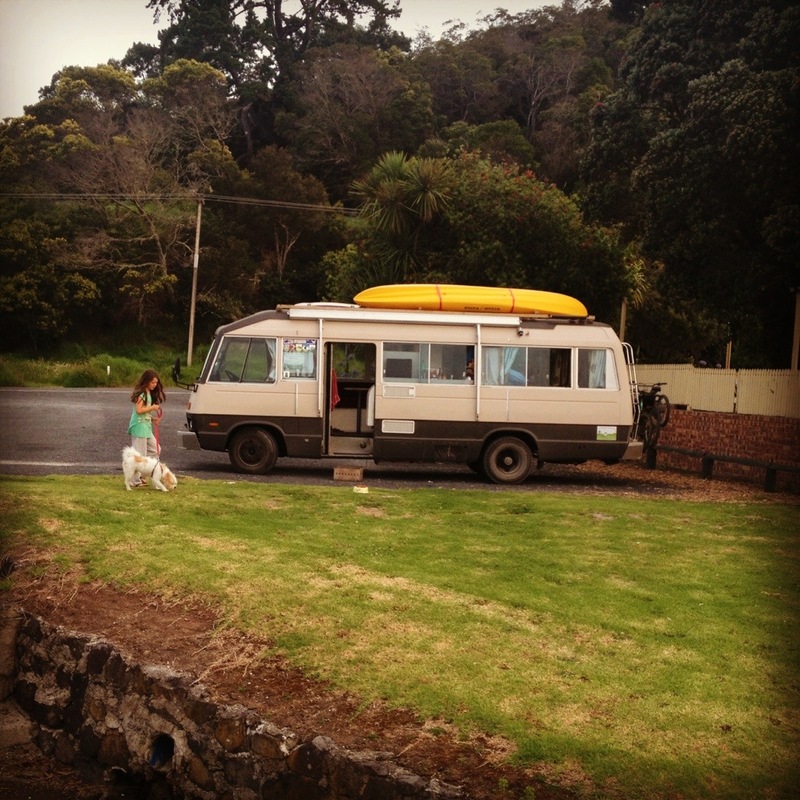 Last night the Kiwi Blog Bus freedom camped at Horeke, Hokianga Harbour. We are next to the Horeke Tavern which has been serving beer since 1826 ( that’s like real old in New Zealand terms!) and I recommend you all should visit this utterly charming place. I’ve had such a peaceful night with just birds waking me this morning to a stunning view. Next on our plans…. We’re actually heading back to the Bay of Islands. We haven’t been over to Russell yet but an invitation was kindly extended to us from Angela & Don of Russell – Orongo Bay Holiday Park to come and stay there. We met them at the motorhome show in Hamilton last year and it’s taken us this long to get up here! The 14 acre holiday park sounds amazing and i’m looking forward to checking out all the facilities. I’m so pleased we can go with our canine friends on board too! I’m excited to get over there (on the ferry) and explore historic Russell and its beautiful surroundings. 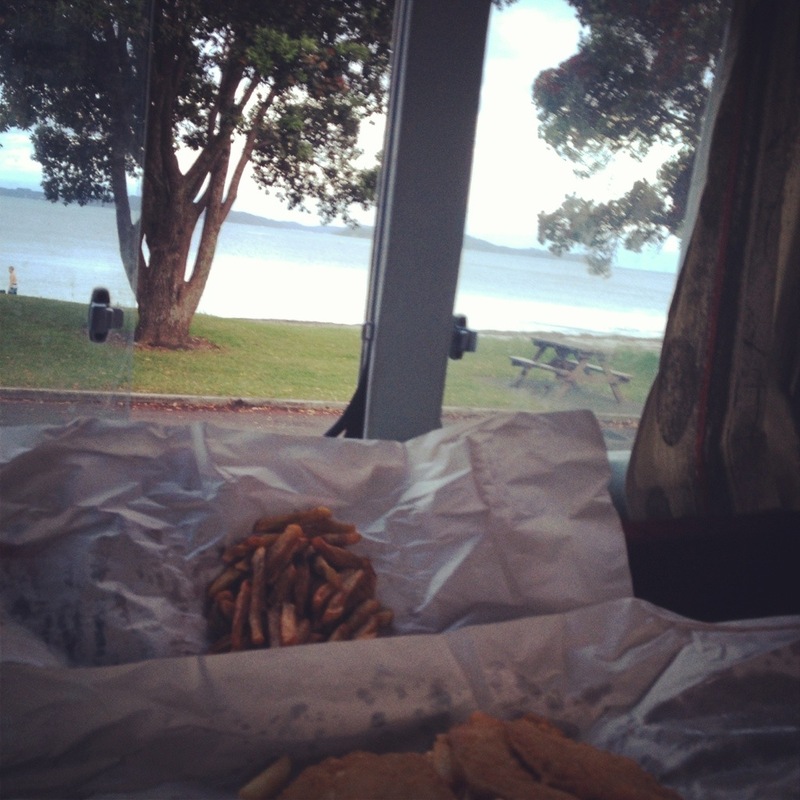 So we’ve skipped to night 4 at Paihia, Bay of Islands. 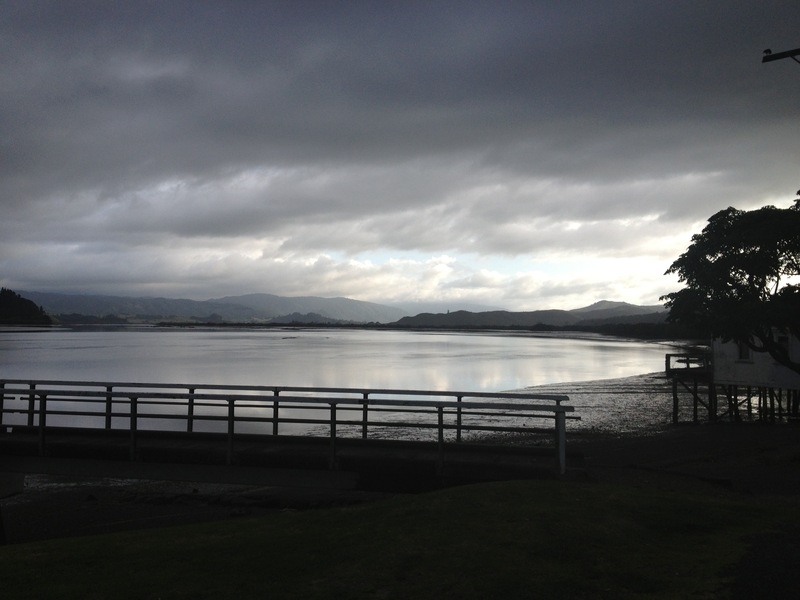 (Night 3 was beachside at Pataua, Whangarei Heads, when a blissful day playing in the water was followed by a noisy rain squall rudely interrupting our sleep at 5am). The day got off to a wet start and we travelled up to The Bay of Islands with low cloud, no views and my disappointment looming. Great, and very handy, playground for the ten-year-old! 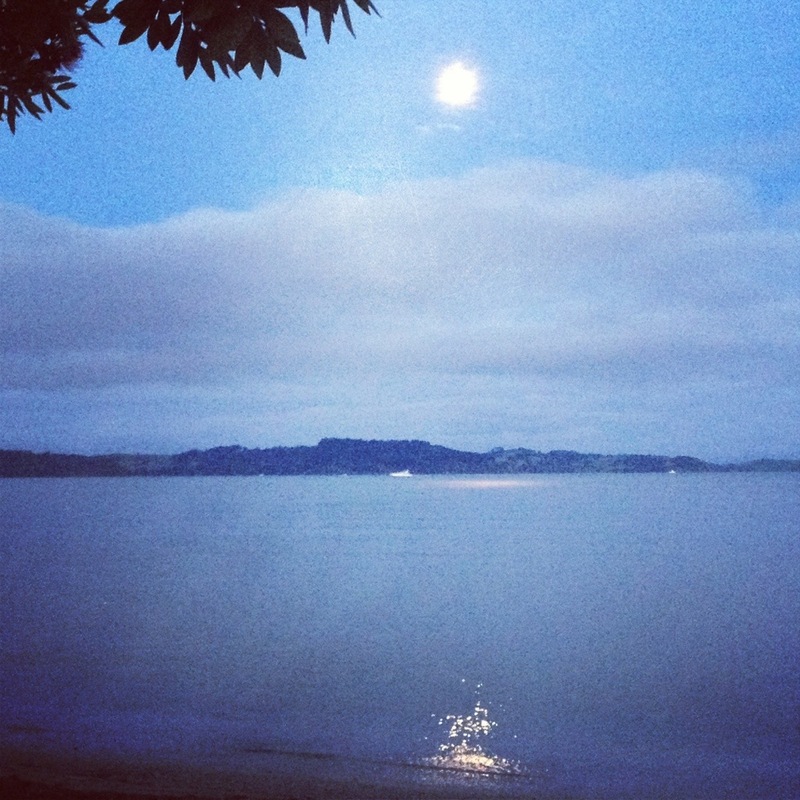 Water is warm and very clear – shall be venturing in further tomorrow but arrived in time for a moonlight paddle. Just a brief post as we’re almost ready to set off on our New Year trip. 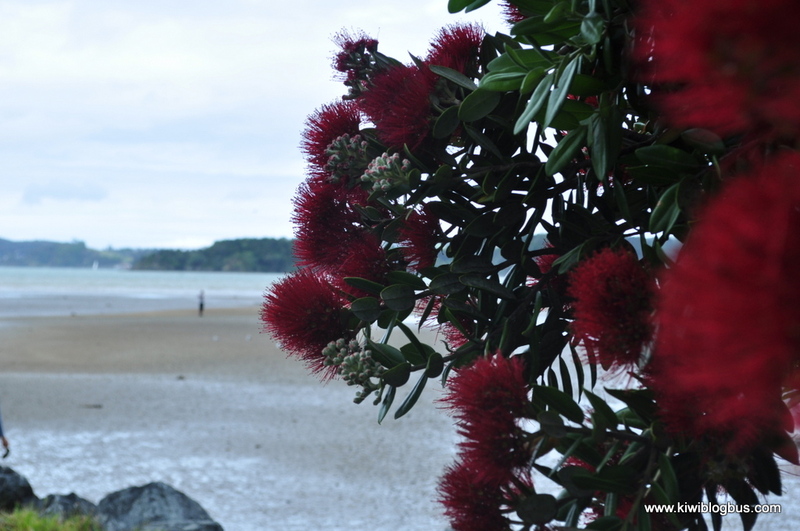 The Kiwi Blog Bus is stocked up and groaning under the weight of all the Christmas leftovers. The togs, towels & jandals are loaded. The body boards are strapped to the roof.